The A1 in North Yorkshire has undergone a lot of investment in recent times and remains a busy trunk road for heavy good vehicles. That means there is a great need for decent truckstops. One such site is Coneygarth services near Northallerton, by Junction 51 of the A1M. 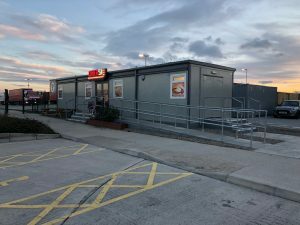 It’s a good truckstop which despite using portable buildings, has plenty of capacity to seat diners and there a decent hard standing, and secure parking area for up to 85 trucks. Part of the set-up is ‘Diner 51’ for truck drivers, which opened just over two years ago in January 2017. The choice of breakfasts is served all day, there is the ‘51 mega’ breakfast at £6.90, the Full English at £5.90 or the small English at £5 and all include the choice of either a mug of tea or coffee. Basic bacon & egg on toast is £3.90 while bacon and egg with either beans or tomatoes on toast costs £4.20. Scrambled eggs or baked beans on toast are both priced at £3.50 while two fried or poached eggs with beans on toast is £4.20. Ham and eggs is £3.90. A bowl of cereal or porridge is priced at £1.50. 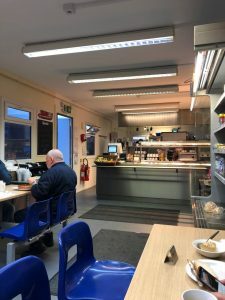 Coneygarth Services also offers a range of hot breakfast baps and while a fried egg bap is £2,50, all others are £2.80 and that includes bacon, bacon with either egg, sausage or tomatoes or sausage – with or without an egg. There is a good selection of main meals available, and as you’d expect many are what you could regards as ‘truckers’ favourites’. They include cottage pie, steak pie, liver and onions and Lincolnshire sausage with onion gravy all priced at £5.90. that is the same price for half a roast chicken or beef mince with Yorkshire pudding and gravy. Braised steak with gravy is costed at £6.20 while gammon with egg is £6.90. A mixed grill or a 10oz steak meal are both priced at £8.90. All these main meal options are served with a choice of chips or new potatoes, beans, peas or vegetables of the day. Drivers should also see the daily specials board. Away from these traditional plates, are a range of omelettes. They start with the plain omelette at £4.90 then one with either mushroom or cheese is £5.20, ham or cheese and ham is £5.40, and a Spanish omelette is £5.50. all are served with chips and beans or a side salad. A 6oz is burger £5.70 and with an egg that’s just 10p more at £5.80. A Chicken burger costs £5.90 while a bacon and cheese burger is priced at £6. The Chilli, breakfast or onion stack burgers are all on the menu at £6.20 and all burger options are served in a bun with chips and a side salad. A plain Hot dog is £3.50 while a chilli dog with cheese or a hot dog with mushrooms and onions are both priced at £3.80 and a hot dog with bacon is £4. Jacket potatoes are available with one filling at £3.80 or two fillings at £4.20 and the filling choices are baked beans, cheese, coleslaw or tuna mayonnaise. You can order a sandwich, bap or baguette with a choice of fillings. Cheese with either tomatoes or onion costs £2.40, while ham and tomato is £2.50 as is tuna mayo or chicken tikka. A bacon, lettuce and tomato sandwich is available for £2.60 and that is the same price for a chicken and bacon sandwich. If you don’t want a cold sandwich, then there are three panini options; ham and cheese or tuna melt are both priced at £3.20 while cheese and bacon costs £3.40. There is a choice of salads, all priced at £4.95 and include half a roast chicken, Yorkshire ham, plain cheese or a pork pie or cheese ploughman’s. A bowl of chips is £2.50 while cheesy chips are £2.80. plain toast and butter is 50p a slice. A sausage roll is charged at £1.20, as is a pork pie, while a pasty is slightly more expensive at £1.80. Bags of crisps or confectionary are 80p each. A mug of tea will set you back £1.10, while coffee is £1.30 and hot chocolate is £1.50. Those wanting a soft drink then cans of pop are 90p each. For dessert, you can order lemon meringue pie at £1.60, while the ever-popular jam roly poly, treacle sponge, chocolate fudge cake – which can be ordered hot or cold – and apple pie with custard or cream are all £2.25. there is also a choice of pre-packed cakes and pastries. 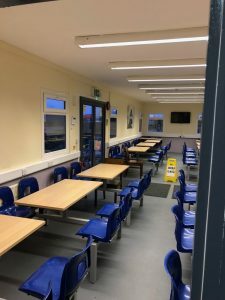 The café is open 0600-2100 Mondays to Thursdays, Fridays is 0600 to 2000 and Saturdays 0600-1100 but it is closed on Sundays. The café seats about 80 drivers and there is an outside seating area to exploit when the weather is good. There is a secure gated parking area with barriers. 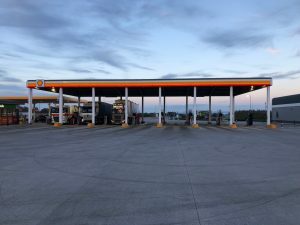 Adjacent to the site is a fuel station which also has a shop for snacks if the café is closed or if you are not stopping for any length of time. This also has a Macemini-mart, a Costa Expressand a Subway. First two hours of parking is free for all vehicles, after which HGVs must pay £17, or £19 to include a £5 food voucher. There are also showers available and a truckwash.